When Microsoft announced message encryption for Office 365 in November, it came with a potentially annoying requirement: People receiving the encrypted messages had to be logged into a Microsoft account to view them. That was all well and good if they were a Microsoft customer, but everyone else had to sign up for a Microsoft account before they could view their encrypted messages. Perhaps realizing this was an inconvenience -- because, as it turns out, not everyone on Earth uses Microsoft's services -- the company has removed this requirement. 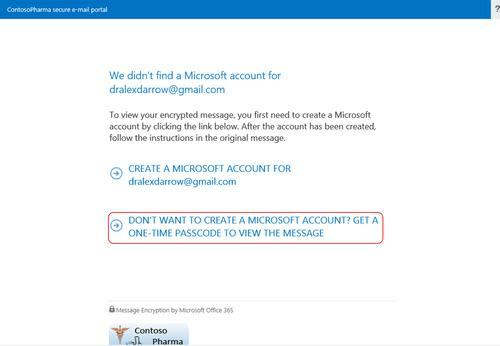 Now, recipients who don't have a Microsoft account -- or who have one but aren't logged into it -- can view their encrypted message using a one-time passcode that Microsoft will send to them via email. They'll then have 15 minutes to use the passcode to view their encrypted message. "You can then choose to reply to the message or forward it. All responses you make will be encrypted," wrote Shobhit Sahay, an Office 365 technical product manager, in a blog post on Friday. Office 365 Message Encryption, which replaced Exchange Hosted Encryption, went live in February and since then has been used to protect the content of more than 1 million emails, according to Sahay. The service is included at no extra charge with the E3 and E4 editions of Office 365. It also comes bundled with the standalone version of Azure Rights Management, which costs US$2 per user/month.